Gotta love bright colors right?! 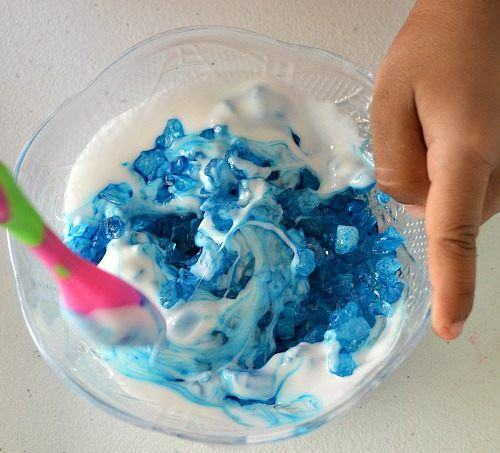 We love liquid water colors and they did not fail us in this sensory activity. 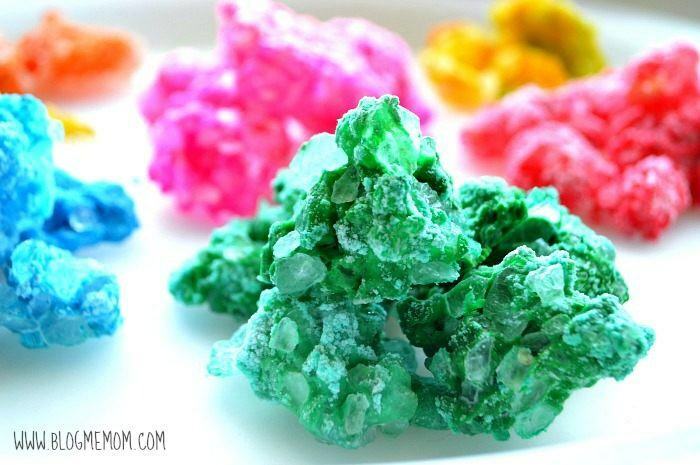 We made sparkly, shiny rocky gems and jewels for play and learning. Any project that turns into a mixing and pouring type of sensory activity is always a great hit. This post may contain affiliate links. If you choose to shop through these links, I will receive a small commission. Thanks for supporting the blog! 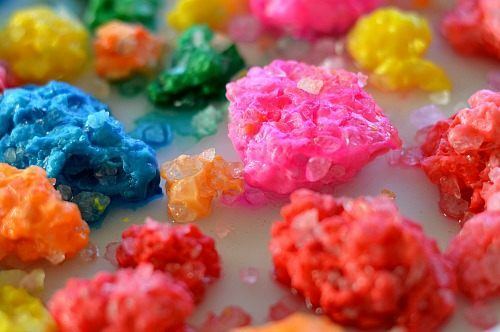 Mixing the white glue with the colored rock salt is a wonderful process in itself. The kids can practice measuring, pouring and mixing. Be astounded with the beauty of it all and take multiple pictures! The glue and salt mix to create an instant gem/jewel effect that only enhances when they dry. You can sort them by colors and talk about real gems and how they are formed. 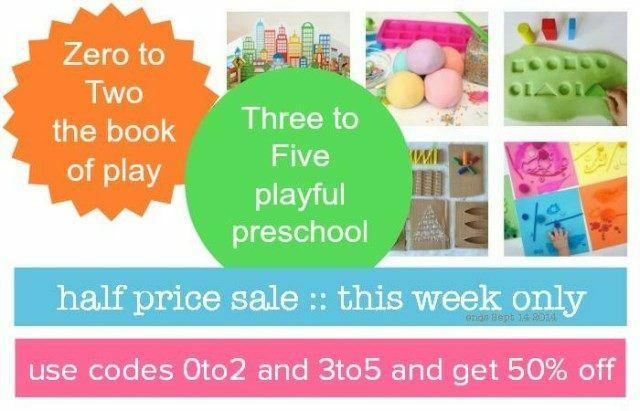 Or the kids can use them in their pretend play as treasures. Once the gem are dry they are pretty sturdy but not sturdy enough to be thrown around like real stones! Yep, that’s our emerald right there. 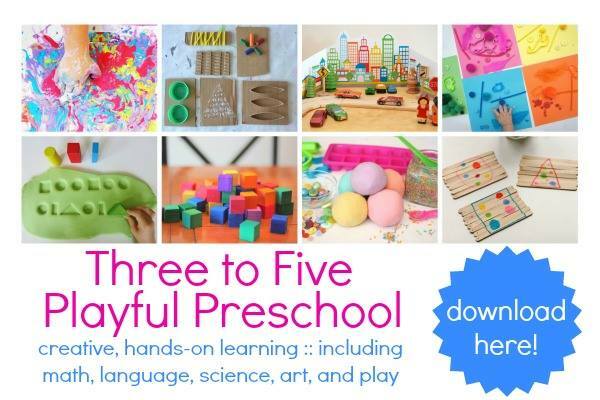 For all our art and play recipes check out the link. 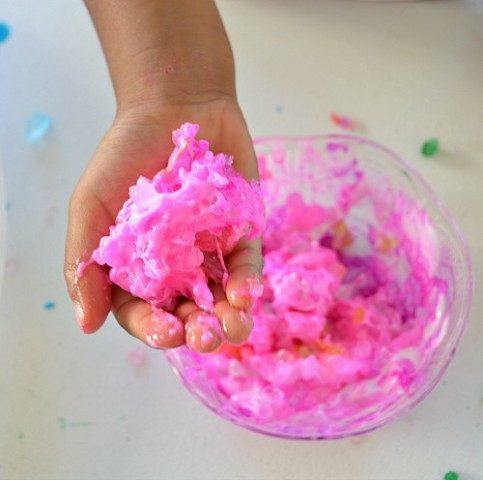 This recipe is a popular one often found in many kids activities book like this one The Everything Toddler Activities Book. 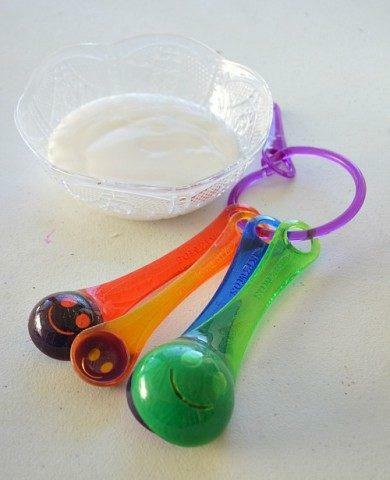 To make multiple colors start off by coloring 1 cup of ice cream salt for each color. 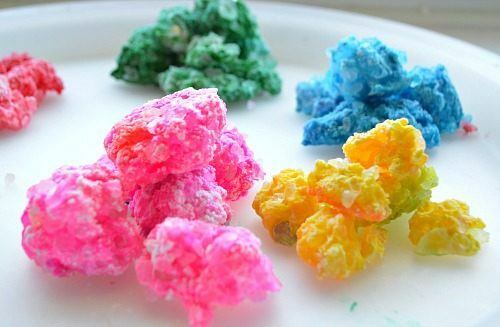 Add cup of rock salt in a plastic baggie (sealed) and add few squirts of liquid watercolors or food colors. 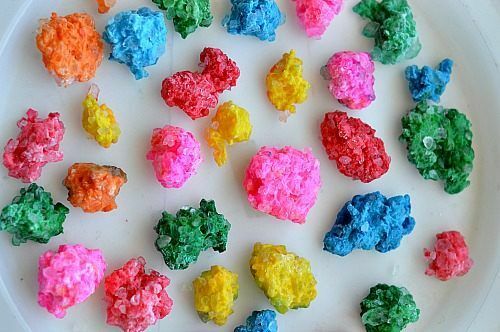 Start shaking the bag to spread the color. 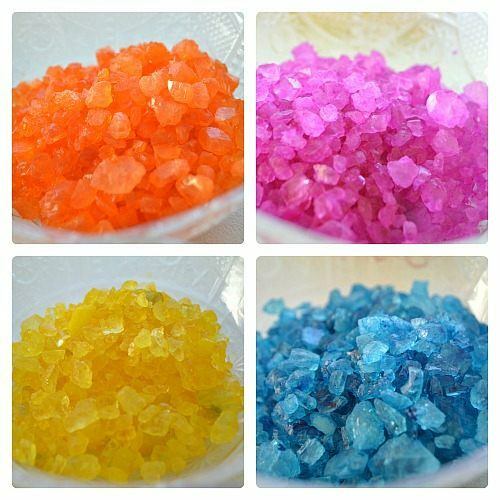 Once you are satisfied with the color, lay the colored salt on a cookie tray to dry. 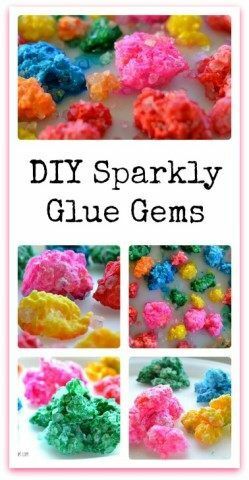 You can also color the glue and add the salt. 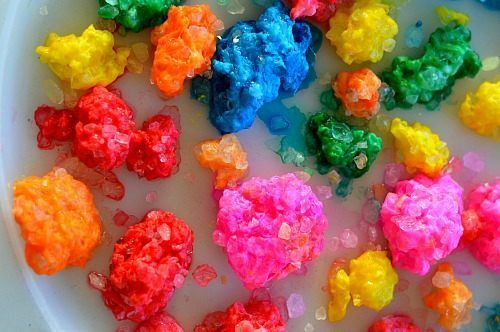 Take 1/4 cup of glue and add your 1 cup of colored rock salt little by little. As soon as the salt hits the glue the glue turns gunky. 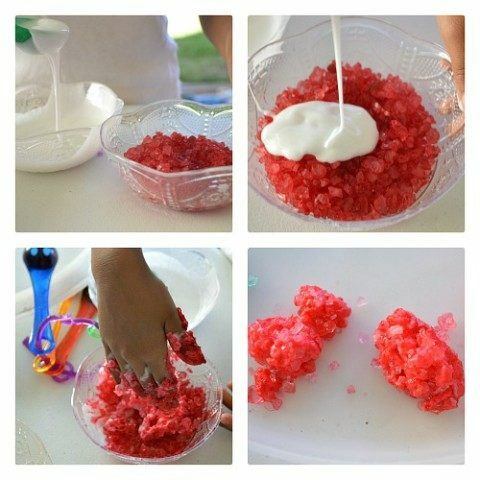 Keep mixing (either with your hands or a spoon) until all the glue is balled up with the salt. 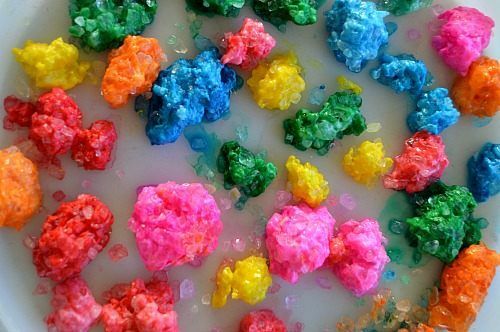 Set all the glue-salt balls ( make desired shapes) on a clean dry flat container. This didn’t work for us either. I used ice cream salt food coloring and Elmer’s glue like suggested. We let are rock salt dry over night. 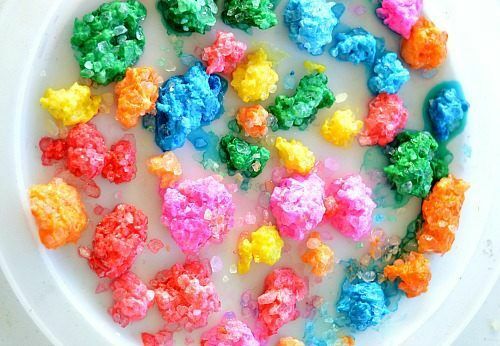 And all that happened was are glue balled up and the food coloring came out of the salt. Any suggestions of what we did wrong here? 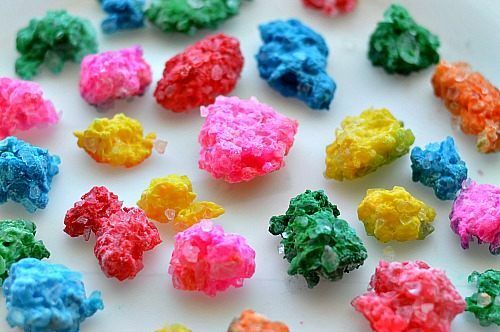 Hi Lily, did you let the colored rock crystals dry thoroughly? Those came out so cool and the colors are so vivid!